There appears to be a resurgence of interest in the works of H. P. Lovecraft. I’ve read a good number of books with Lovecraft’s name in the title, and seen many more. Lovecraft’s mythology-building and god-making was legendary and his creations still stand the test of time, hence an anthology based on some of his creations. Ellen Datlow has put together this collection, culling stories from other works and commissioning others. I’ve been impressed with the books that Datlow has edited before (of those I’ve read, of course), so I suspected that this would also be a top-notch anthology, and indeed it is. Too often I’ve read anthologies on a theme where many of the stories fit the theme only by the barest of margins. That is not the case here. 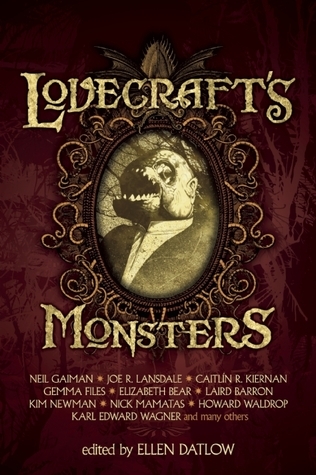 The discerning Lovecraft fan should be able to see how these stories do, indeed, fit in the Lovecraft’s Monsters theme. I found that it definitely helped serve as a reminder to have the monster index at the end of the book (it’s been a long time since I read Lovecraft’s work and not a derivative of them). As with most anthologies or collections of short stories, my enjoyment of the works will vary. I very much enjoyed the story by Neil Gaiman (and it is probably the most anthologized of the bunch), and some of the other better-known named authors (to me, at least), such as Karl Edward Wagner and Joe R. Lansdale and Laird Barron, put forth some wonderful stories. “Black is the Pit, from Pole to Pole” by Howard Waldrop and Steven Utley was perhaps the one story that didn’t fit as well in to the theme. Instead, it primarily features Frankenstein’s Monster rampaging through the subterranean tunnels that scour the earth. This is a Mary Shelley/Jules Verne mash-up more than a nod to Howard Phillips Lovecraft. I’m also not one to enjoy poetry, so the two short poems by Gemma Files were not something that went over well for me. However, the artwork inside the book was lovely. The book is peppered with black and white art by John Coulthart and it is wonderful. The images are haunting and eerie and a really great addition to the book. It’s too bad that his name isn’t more prominent. I could only find reference to John Coulthart being the artist from the copyright page. Looking for a good book? Those who enjoy reading Lovecraft, should enjoy these short stories, mostly based on some of Lovecraft’s creations. 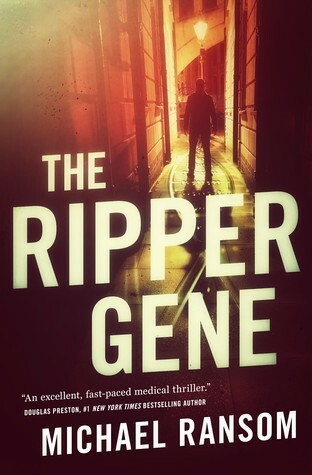 Michael Ransom’s debut novel, The Ripper Gene, is a fast-paced who-dunnit thriller that should keep you glued to the pages of the book. I read this book in three sittings, and only reluctantly stopped reading the first two times. Dr. Lucas Madden is a former neuroscientist who has become a FBI profiler. His most impressive work as a scientist is that he isolated what he coined the “Ripper gene” in the DNA sequence and proposed that this could determine a predisposition to become a serial killer. Now, as a FBI profiler, Lucas is assigned to a case that’s being dubbed The Snow White Killer due to the apple found in the hand of his young female victims. But even early on, Lucas can’t shake the feeling that these killings are targeting him , somehow. And when his ex-fiancée is not only kidnapped, but accuses Lucas of committing the crime, he knows he has to solve the mystery quickly. This book moves along really well. Ransom knows how to hold the reader’s attention and keep us wanting to get to the next moment. The book got off to a slow start for me. The first three or four chapters moved very slowly as our main character was being established. One incident, and Ransom’s expounding on it, had me worried early that the book would be full of characters jumping to conclusions. Very early on, Dr. Madden is giving a lecture to a number of FBI agents. When he opens the floor for questions, he gets one question, which he answers quickly, and then a female agent asks him a question, which, through her explaining the question, prompts a second question – “have you tested it yet?” By his own admission, Madden is “perturbed, but only because she was partly right – we hadn’t tested it in the real world yet.” He then senses that the agents in the room expect some verbal sparring, and he shuts down lecture and Q&A session. Pretty quick and simple. Except, only two paragraphs later, when someone asks how it went, he says “I think I had a detractor,” and the woman is immediately identified. And later still (in the same chapter), after meeting with the woman, he thinks “Despite our bout in the Q and A session after the lecture…” Hmmm… one question, that was a sore point because it was accurate, is considered a ’bout’? I definitely had concerns that this character was going to be awfully wimpy if he can’t shake off a very tame Q&A session! Three other moments in the book bothered me enough that I had to make note of them. Discussion of these notes definitely constitute SPOILERS! …I don’t know about a hunch. I don’t like it. But I can’t deny that it’s significant that the DNA in the bloody letters is coming from the same source. I’m willing to throw you a bone and let you keep working on this angle. But it’s low priority. Understood? Blood found on the victims matches and it’s not from the victims, but it’s low priority?! That was a tough moment to accept. But also tough… not one of the brilliant FBI or local law enforcement agents ever stopped to think… they began to realize that the letters written on the foreheads were a DNA sequence, not words, and that each of the victims had small pin-pricks on their fingers. Now…I’m not a scientist, but my first thought is that someone with access to blood testing equipment is the killer. I’d be ordering checks on hospitals, clinics, and EMTs in the area! But apparently this is not normal law enforcement thinking, because no one else thinks along these lines. And finally, near the end of the book, when Madden recognizes that his father is in danger, Madden and his partner rush to the father’s home. There is clearly evidence of a struggle (mentioned at least twice). There are papers scattered about, but on one of them, Madden’s father has written a cryptic message … a clue as to where he’s been taken. Read that again, carefully. After a struggle, he leaves a note in his own home, to give his son a clue where he’s been taken. If he hasn’t been taken there yet, how can he leave a note as to where it is? Okay…maybe we can buy the fact that the kidnapper is telling him what’s going to happen, but how is there time to write this out after a struggle? Sorry this just didn’t pan out well enough for me. But even with these moments that struck me as not quite right, I enjoyed the read and really did get caught up in the story (which is perhaps why these moments stuck out to me so much) and I would recommend it to anyone who enjoys mystery/thrillers. Looking for a good book? The Ripper Gene, by Michael Ransom, is a fast-paced, exciting mystery that will have you riveted to the story. An excellent first novel. What happens when Santa Claus decides that he’s no longer going to punish the bad boys and girls by giving them coal in their stockings, and instead reward the good boys and girls with something extra? Well, the man who has supplied Santa with coal for all these years is suddenly out of a job. That’s the basic premise of the children’s Christmas picture book. A new take on a Christmas storybook is ‘gold’ to anyone who can devise the right story that will capture the reader’s interest, but I think this story is going to stay in the coal mine. The biggest problem here is that there really isn’t any story, and Santa and Christmas play almost no role, other than providing a backdrop for our coal miner. What little story there is tends to be confusing, especially to those to whom this book is targeted. The coal miner has a job mining coal for Santa Claus. But he’s getting tired and wants to retire. He tells his trusty donkey that after a couple more hauls, he’ll have saved enough to finally quit the mining business. Then Santa tells him that he’s going to go with rewards instead of punishments and he won’t be buying any more coal. And suddenly the miner seems to be in a panic. Despite planning to retire, he’s now worried about how he’ll get by. When he trips and his bag of coal drops, there a few diamonds mixed in with the coal and the miner realizes that he can now retire. And he still works for Santa but does so by picking shells on a sunny beach to use as gifts for the best good boys and girls. So…the seashells are a good gift to give the good boys and girls? What about the diamonds? As I was reading through this the first time, I really expected that the diamonds were his way to retiring by selling them to Santa to use for the exceptionally good girls and boys. If seashells are the new stocking-stuffer from Santa, why did we need the pages of the miner discovering diamonds? Why not just send him straight to the beach and have him sell Santa on the idea of the shells? Why muddy the story with the diamonds? Aside from not fitting in well with the story itself, it possibly fuels the incorrect thinking that diamonds are formed from coal. The story just didn’t catch my interest very early and it doesn’t develop. The art is fair but not outstanding. There are some pages with very nice, colorful artwork, and other pages have a much more cartoonish look to them. The art serves the story, but it does not rescue it. Looking for a good book? 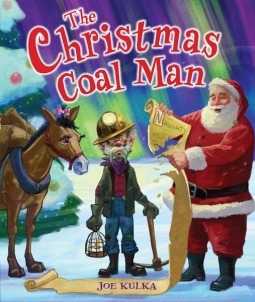 If you’re looking for a new children’s book for the Christmas holiday, The Christmas Coal Man by Joe Kulka definitely has a unique story, but you may not find it very engaging. In the near future, in a post-apocalyptic town, a small community is controlled by a computer which calculates all the algorithms to determine precisely what each person needs and can provide for the community, and also determines who stays and who is no longer necessary and must be expelled from the community. This is called The Process, and each member of the community must abide by it. James, the town bailiff, is the human responsible for seeing to that The Process’s requirements are fulfilled, including the removal of residents to the outside. When the computer begins to make robot soldiers in preparation for a war (the recreation of a battle from World War I, to be more precise), a fight in which James must also be a combatant, James struggles to understand how something he has believed in and served faithfully can be not just predictive, but proactive and planning as well. How does a faithful follower of The Process deny everything he has believed in, even when he recognizes that The Process has evolved to something he might not agree with? 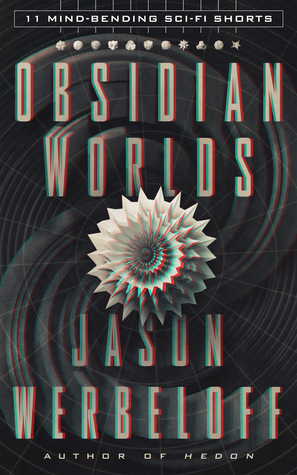 This is a really tremendous speculative fiction book that examines humanity and society. Making people relive a war, wasting human life for no apparent reason has us thinking back in history and wondering how it’s different. And how is it different, to send the people to fight a war, than removing them from the safety and comfort of their homes simply because a computer says it should be so? The tenor of this book reminds me of the speculative fiction writers I was reading back in the 1970’s. Michael Bishop, Thomas Disch, Gene Wolf, Roger Zelazny. I consider some of their work to be thoughtful, introspective studies on humanity and self. And while it reminds me of these authors, this book strikes me as quite original. I was hooked early on with author Matthew de Abaitua’s descriptions of the people and the community. He created something very real and easy to believe in, and managed to let us know right away that we were outside our modern norm. And James’ journey of discovery is our journey as well, even if we don’t identify with him. The book is intense and complex. It is not an easy read, and will demand that the reader pay attention. I will admit that in my first reading, I got lost for a bit in the middle section of the book, and had to go back and re-read portions of it to keep up. Part of this is on me for not keeping up. Part of this is on de Abaitua for not drawing me tight enough through the entire book. I am impressed with science/speculative fiction is headed these days. If you want something more than just a space opera or fantasies with trolls and elves and lots of magic, there are strong works out there, such as this one. I’d also like to comment on the publisher, Angry Robot. There was a time when I’d visit the bookstore and look for a book published by DAW and know that more than likely I’d get something worth reading that was powerful and imaginative. I discovered Michael Moorcock and John Brunner and Ron Goulart and many others through them. And while there are many VERY GOOD publishers of fantasy and science fiction out there, and some of the best books I’ve read have come from other publishers, Angry Robot is probably the most consistent. With few exceptions, I’ve been really captivated and impressed by books under their imprint. They are proving to be a company that you can recommend. Looking for a good book? 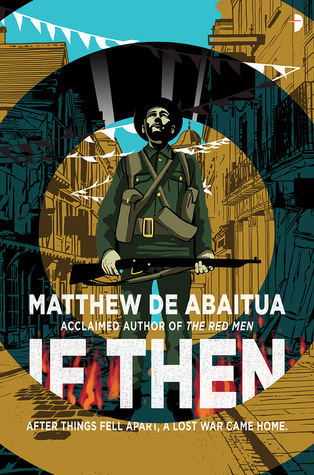 If Then, by Matthew de Abaitua is a powerful speculative fiction book exploring humanity and community and is a book fans of the genre will want to read. First of all, I have to admit that I did not realize how famous these chess pieces are. I did not know that these specific chess pieces were used as the models for the giant chess pieces depicted in the Harry Potter movie. Referred to as The Lewis Chessmen, they consist of 93 chessmen pieces, hand carved from walrus ivory, that were uncovered on a beach in Scotland in the early 1800’s. And why are they ‘viking’? Well, that’s part of the story, but a big reason is that the soldier pieces resemble the viking Berserkers. To get to the origins of these beautifully carved game pieces, author Nancy Marie Brown leads the reader through a great deal of history and the sociology of the period, focusing on Iceland but including a number of Scandinavian, Germanic, and British countries. The leading candidate for the creator of the chess pieces was a woman known to us now as Margaret the Adroit, “who at the time was the most skilled carver in all Iceland.” Nancy Marie Brown’s book pieces together the likelihood of Margaret the Adroit’s work coming into contact with many of the famous movers and shakers of the period. To do this we get a lot of background, both historical and archaeological, of the period, as well as some legend and mythology that complements the rationale. This is such a wonderful book. Anyone who enjoys non-fiction, particularly history, should be sure to read this book. While we know this, intellectually, we don’t often think about the fact that, as the book notes: The bygone ages of the world were actually filled with living men. This books serves as a wonderful reminder. Looking for a good book? 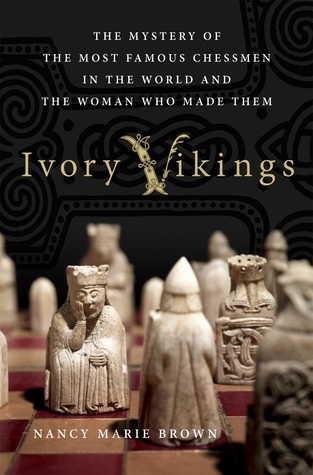 Ivory Vikings, by Nancy Marie Brown, is a tremendous examination of the legend and history and people surrounding one of the great discoveries of the 19th century, the Lewis Chessmen, and you should read it. In so many ways this book seems tailor-made for me. I love the short story as a literary form. I love weird fiction and science fiction. I tend to root for the under-dog, and the self-published author is definitely an underdog. The eleven short stories in this book are highly imaginative. Author Werbeloff can take an ordinary moment and skew it to an interesting angle. His writing is crisp and the stories are easy to read, even if they are bit oddball in nature. Although all the works are good it was easy for me to pick two that stood out as being exceptional. “The Time-Traveling Chicken-Sexer” not only has one of the best titles I’ve come across in a long time, the story has a developed background and interesting characters that rise to the occasion. And the last story, “The Experience Machine,” really had me interested. I was glad to see that this is actually a prequel to his novel Hedon, which I have but have not yet read. I’m definitely interested in getting it read now. There is one aspect about Werbeloff’s writing however that keeps this collection from being outstanding. Every story in this collection carries the same tone. I noticed this about the third story in, and it held true all the way through, until “The Experience Machine” (which did have a different tone). We know that writers have certain habits and tend to write in predictable ways (this is how historians determine which plays are actually written by Shakespeare), but I’ve never read anything where this became so obvious. Individually, these stories could really stand out. But together, they actually show a lack of range. My suggestion: don’t read these in one sitting. Read one or two, then read something else for a bit, then read another one or two. Looking for a good book? This collection of eleven short stories is highly creative and worth reading, but perhaps in small doses. I received a digital copy of this book from the author, in exchange for an honest review. I request a lot of books for potential review, and sometimes I’ll request a book but will have reservations about the title before I read it. Such was the case with this graphic novel. I’m a fan of Norse mythology and I’ve been really delighted to see an increased interest in this mythology. And of course I’m a sucker for anything that draws upon these myths. At the same time, I was a little worried to read yet another Ragnarok story featuring the god of thunder, Thor. Even though the Norse myths are just starting to hit a stride, I feel that we’ve already had stories about the end-of-times battle of the gods. 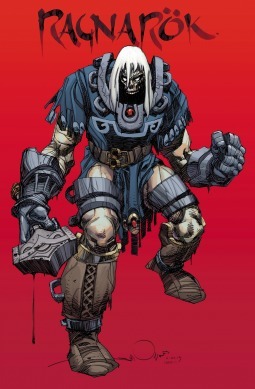 But Walter Simonson scores big with his story, simply titled Ragnarok, Volume 1: Last God Standing. In the story, the gods have fallen at Ragnarok. In the surviving world, inhabited by draugers (walking dead), trolls, and elfs, a dark elf bounty hunter is out to destroy the ‘stone god’ — a manacled drauger/god who wakes , thanks to a greedy mercenary with the elf. The god is Thor, not quite alive, not quite dead, has no knowledge of what has happened at the battle or what has happened to the other gods. Upon waking, he ventures out, seeking answers and his other gods. This story is epic. I don’t use this term loosely (or often), but in this case it fits. It is an epic story and it is so well told! Author Simonson clearly understands the medium and does an exceptionally fine job of building the story within the 21-page comic book, but also building a story for the longer graphic novel, while also clearly building a much larger story that will span multiple graphic novels. This is not an easy feat, but Simonson handles this with ease. We are also both captivated and revolted by our god, Thor. This is not the god of the long blond locks that we see on the movie screen or in the Marvel comics. This is a god who died in battle and lives on: lost, confused, frightened, but still frightening and powerful and determined. Just reading this I was somehow in awe of this god’s power … something I don’t typically sense from graphic novels. This is the complete package. In addition to a well-crafted story and truly engaging characters, the artwork here (I presume also by Simonson as it is otherwise not credited) is fantastic! It is bold, sharp, and powerful. The coloring is some of the best I’ve seen in a graphic novel in the last few years (I think I’ve only praised the coloring in a visual book like this once before). I can flip to any page and look at art that is appealing and striking. There isn’t a bad panel here. This is what a graphic novel is supposed to be … the perfect blend of story, character, and art. I would recommend this book even to those who’ve never opened a graphic novel before.